Alnor Hotel and Convention Center, Alnor Commercial Center, Sinsuat Ave; +63 64 552 0188. Arguably the most modern and upscale hotel in the city. Azaleas Pension House, Bormaheco Dr; +63 64 421 8122. For basic and affordable lodgings. EM Manor Hotel and Convention Center, RH 9 Sinsuat Ave. Modestly-furnished rooms with comfortable beds and decent WiFi. Babo Katips Eatery, Caltex Gas Station MB Tamontaka; +63 64 552 0065. This Halal-certified restaurant is the best place in Cotabato for fried hito (catfish), which is sold by weight. BBQ Stand, Japal Guiani St. Feast on grilled meats on skewers at this joint, which is open around the clock. Café Le Sorelle, Sema Bldg, Sinsuat Ave corner Macapagal St; +63 64 421 9988; facebook.com/cafelesorelle. Try the pastries and cakes – including the signature carrot walnut cake – at this café. Hala Bira Halal Food, Jose Lim St; +63 939 135 6215. Enjoy local dishes like papaitan (soup with cow or goat innards) and bulalo (soup with beef shank and marrow). Hashy’s Asian Cuisine, Sinsuat Ave. Favorites at this friendly restaurant include the blue mussel seafood pasta, and crab rice. Jamaica Le Cafe, Al Nor Complex, Sinsuat Ave; +63 64 552 0267. Enjoy flavorful nasi goreng (Indonesia-style fried rice) at this Halal eatery. Mardoney’s, Don Rufino Alonzo St. Fill your belly with a piping hot bowl of mee sua (salted Chinese noodle soup). Pagana Kutawato Native Restaurant, Rufo Manara St; +63 64 552 0592. Tuck into tasty local specialties like chicken in coconut curry, and raw tuna fish. Reese Resto, N.Herrera Building, Pob 5 Quezon Ave, +63 64 421 1085. Treat your tastebuds to hearty dishes like baby back ribs and buffalo wings. Sweet Bliss Cafe, Sinsuat Ave. A Halal restaurant serving up mouthwatering cakes and pastas. Sugar Pappi, Sinsuat Ave; +63 915 877 3797; facebook.com/TheSugarPappi. Specializes in cupcakes and pastries. The S’mores cupcake is a must-try! Tatis Resto Bar and Grill, 27 Ramon Rabago St, Mother Brgy. Rosary Heights; +63 64 552 0536; www.facebook.com/tatisresto. Order the deep-fried hito with tanglad (catfish with lemongrass), which is best enjoyed with homemade coconut vinegar. 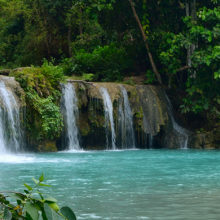 Asik-Asik Falls, Sitio Dulao, Brgy Upper Dado, Alamada. The crystal-clear water from this beautiful waterfall is considered by scientists as among the purest in the world. Barter Trade Center, Gov. Gutierrez Ave. Bargain for inaul, a famous Maguindanao handwoven fabric often used as a sarong. You’ll also find other handmade souvenirs and imported Malaysian goods. Kutawato Caves. These are the only caves in the Philippines that are nestled in the heart of a city. Lake Sebu. This lake is famous for its strikingly beautiful waterscapes. It is also the ancestral home of the T’boli people, one of the most intriguing drives in Mindanao. Lake Sebu School of Living Traditions, Poblacion, Lake Sebu; facebook.com/LakeSebuSLT. Learn more about the traditional arts of the T’boli tribe at this cultural center and traditional homestay. Here, children learn to play the drums and kulintang (gongs), dance the tahaw and weave t’nalak (T’boli tapestries), on top of learning the community’s long-held values. Lake Sebu Seven Falls Zipline, Brgy. Lake Lahit, Lake Sebu. The two ziplines here are touted as South-East Asia’s highest, at 180m high. Zoom over the lush landscape and take in picturesque views of the waterfalls. Mall of Alnor, Sinsuat Ave; www.mallofalnor.com. Shop to your heart’s content at this new commercial complex, which also houses a cinema. Masjid Dimaukom, Datu Saudi Ampatuan, Maguindanao. Also known as the pink mosque. Interestingly, it was built by Christian workmen to symbolize unity and inter-faith brotherhood. Metal and Brass Foundry, Brgy MB Kalanganan. You’ll find traditional kulintang (brass gong) and other brassware at the oldest and only brass foundry in the city. Padang-Padang Adventure Park, Parang. Try your hand at adventure activities like ziplining at this park, located 1.5 hours away from Cotabato City. Sultan Haji Hassanal Bolkiah Masjid (Grand Mosque), Tamontaka Bubong Rd. The largest mosque in the Philippines, which cost an estimated US$48 million to build. Takumi Butai Memorial Shrine, Barga Lawn, San Sebastian Compound. Built in honor of the Japanese commander Col. Takumi Butai and other Japanese soldiers who died during World War II, this is a must-see for its scenic garden.